Police in Georgia released video Thursday morning of two dogs being rescued from a boiling hot car in a movie theater parking lot over the weekend. A concerned citizen called 911 after finding a dog left in a hot car Sunday afternoon, WSB reports. Roswell police said officers arrived at the Studio Movie Grill about 18 seconds later. One of those officers was wearing a body camera that captured the entire rescue. According to a Roswell police report, it was 89 degrees outside with 52 percent humidity that day. But inside the Chevrolet Impala, it was much hotter. The officer’s thermometer read 167 degrees in the front seat, despite the fact that all four windows were cracked. “The windows were actually cracked. All of the windows were cracked. But that doesn’t mean, you know, that the car is getting any sort of breeze. It was parked directly in the sunshine. There was no shade for this car,” Roswell Police Officer Lisa Holland said. After freeing one of the dogs, officers discovered a second dog inside. They said the animals were in a frenzy when they were pulled out of the car. First responders opened a fire hydrant to cool the dogs off. One of the animals fell into a seizure as police went inside the theater to search for the dogs’ owner. Holland said she was inside, watching a movie with her family. “That’s just crazy and bizarre. There’s no words to explain how stupid a person can be. Excuse me,” said Beloadea Omerto-Anderson, a witness who wanted to adopt the dogs, who are now living at the Fulton County Animal Shelter. Police said the dogs were suffering from heat stroke, but are doing OK now. The owner was charged with animal cruelty. “There’s no way you should have had them dogs in the car. It’s just horrible and horrific how the dogs even look,” Omerto-Anderson said. But Omerto-Anderson can’t adopt the tiny dogs, because they are evidence in a criminal case. Police released the body-cam footage in an effort to spread the word about the dangers of leaving pets inside a vehicle when it’s hot out. 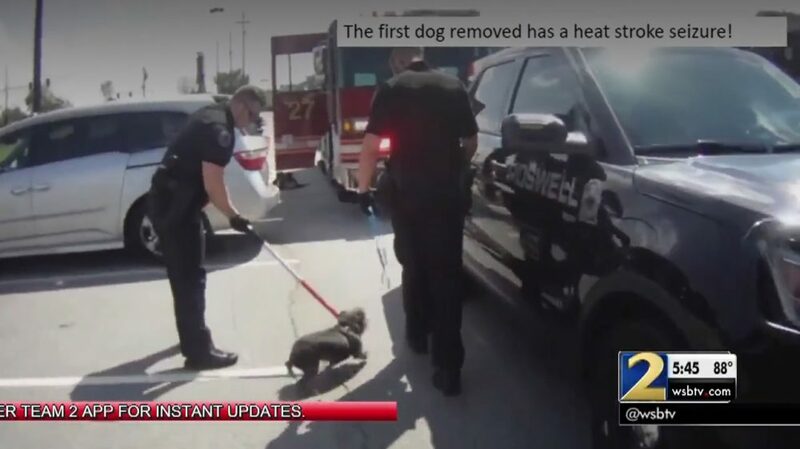 They asked the public to call 911 if they see an animal trapped inside a hot car to prevent future tragedies.